Let roasted veggies come to the rescue this holiday season! A gorgeous mixture of these veggies make the perfect side dish for the holidays and then repurposed for a multitude of dishes for meals post-holiday. (because your company still has to eat, right?) Think omelets or frittatas, salads, grain or noodle casseroles, soups, pizza sauce, marinara sauce, pasta primavera or just snack on them straight out of the container. 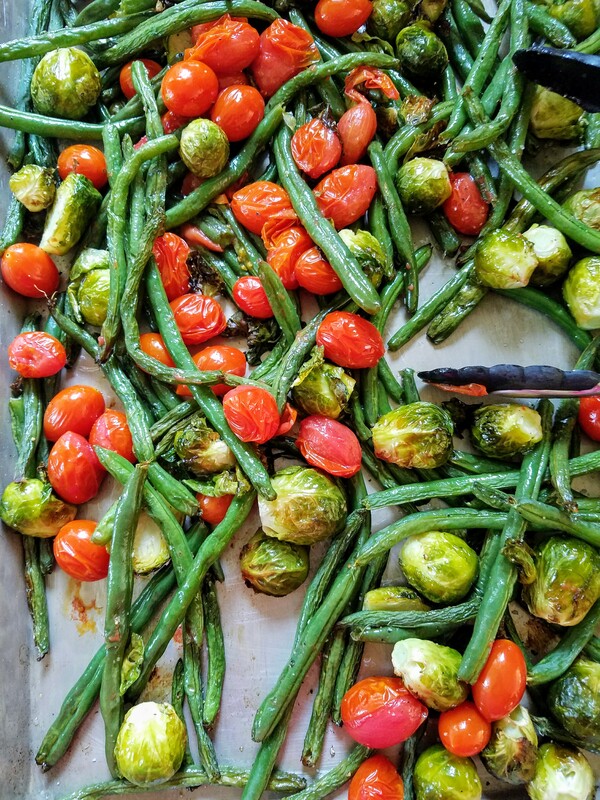 I love roasting a HUGE batch of these veggies at one time-we’re talking 2 sheet pans full- to get the most out of my oven time. For good measure, throw on a head of garlic ( with the tip cut off about 1/2 an inch, drizzled with olive oil, salt, and pepper and wrapped in tin foil) to use on the veggies themselves or for any dish you want to deepen with a mellow garlic flavor. 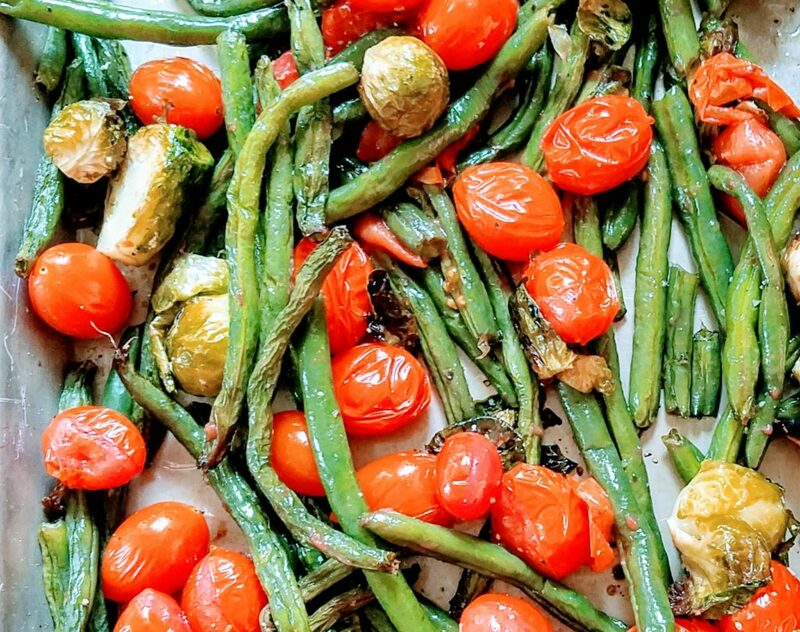 Place all veggies on a large sheet pan. (Once washed, dry vegetables completely before adding them to the sheet pan). Slowly drizzle olive oil on vegetables until they are lightly coated. Sprinkle with salt and pepper. Using your hands, mix the vegetables until they are coated evenly with the oil, salt, and pepper. Place sheet pan (s) into the oven and allow to roast for about 10-15 minutes, shaking the pans/stirring the veggies once or twice to ensure they don’t stick or burn to the pan. Remove from oven and serve immediately OR allow to cool and store in the refrigerator. If serving at room temperature, remove from the refrigerator at least 3o minutes prior to meal time. Line baking sheets with parchment paper to allow for easier cleanup. Add herbs and spices, flavored oils, etc. based on your preference. This is just a basic roasting recipe for you to build on. Add as many different veggies as you’d like–or don’t! Remember the thicker veggies (potatoes, onions) might require more cooking time. Remember that all ovens are different! Be sure to peek in on your veggies to ensure they don’t burn. Nope, there no measurements here. You can do as little as a handful of each or as much as several pounds of each. It’s up to you. Adjust oil and seasonings accordingly.